Apple patents come a dime a dozen, but these two seem both practical and implementable. The first outlines a solar powered iPod and the second details more specific gesture-based input methods, including scoops, nudges, and tilts. 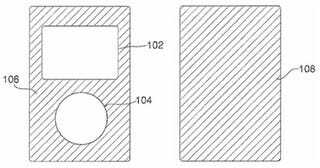 The first patent, published last week, details a system in which an iPod draws power from solar cells covering the device. It includes a description on how constant voltage could be maintained even with the user's hand obstructing some of the cells and explains how the solar power could be used in conjunction with traditional batteries. The less I have to plug my stuff in the better, I say. Check! I was initially skeptical of my MacBook's multitudinous multitouch, but I was quickly converted and now I'm swishing and flicking like a Hogwarts First Year. Apple's next patent expands on gesture-based input, detailing an input device with the ability to sense force and velocity. These sensors allow the hardware to register more more complex and more specific gestures, giving the user more precise control over their devices.